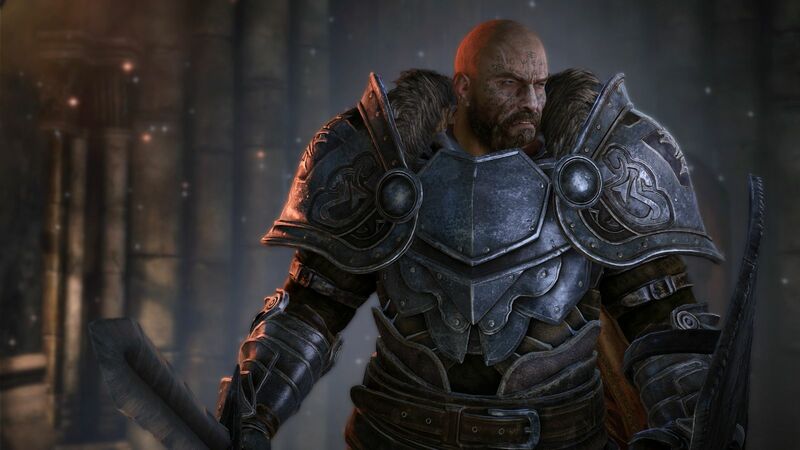 Recently, I had the fortune to get my hands on Bandai-Namco’s upcoming Lords of the Fallen title, which is being released on the PlayStation 4, Xbox One and PC / Windows platform. For months on end, I’ve followed this title and to finally get a personal hands on experience was something that I hadn’t planned on but of course I jumped at the chance. Before I go any further I have to be fair here and say that out of anyone I know or even from the Outerhaven crew that I am a huge fan of FROMSOFTWARE‘s Soul series and that I’ve played all of the titles on both the console (PS3 / Xbox 360), PC and have multiple play-throughs on both platforms. So, while I can say that I am very versed on the series, I also went into the mind set that Lord of the Fallen would play the same or at least very similar. While that’s not fair it is deserved as CI Games and Desk 13 have taken on the task of emulating Dark Souls and even went on record stating that they are fans of the series. You can definitely see the influences of the FROMSOFTWARE games all over the place. So be warned, if you’re trying to emulate and improve on a gaming series that is very near and dear to my heart, then I’ll expect you to stay true to the task or else right my wrath… er, criticism. Lord of the Fallen at first glaze would more than likely be confused as an entry in the Soul series and I’m not kidding in that aspect. It looks like a Souls game, it plays similar to the Soul series games and there are a lot of similarities between the two games. For example when you die you don’t lose souls but experience and that experience that can be picked up that same way that your souls would be after an untimely death. Your character has a number of attacks that are changed depending on what type of weapon you were using, you can change stances between single or dual wielding of said weapon and of course you are also able to dodge and roll to escape or mitigate attacks that would otherwise harm you. Sound like a Souls game? However, as my play through had show me that’s where it all stops and not in a good way. Right off the back Lords of the Fallen is a beautiful game and it definitely looks like a current-generation title, the graphical fidelity in the title is pretty high and that was running off of a PlayStation 4. I didn’t notice any jaggedness, the environments that I saw were very detailed and even the effects such as when you set an enemy on fire were impressive. There were some issues with the frame rate and I don’t know if I was playing a finished build or not but I really didn’t feel that it was a constant 60 FPS. There definitely were dips here and then but mainly when there were a number of creatures on the screen at times. This wasn’t a common theme; however, so that’s a positive and hopefully that will be tweaked before release. That also has been a recurring issue as CI Games and Deck 13 have gone on record to state that the game will drop to locked 30 FPS if the variable FPS drops below 50 FPS. That begs to ask why not just lock it at 30 FPS and make it fluid through the entire game vs a variable FPS which those with keen eyes are surely going to see. At times; however, I wasn’t able to view my weapons as they tended to disappear from time to time but I chalked that up to bugs which will be fixed by the time is released which is in 3 months, hopefully. Going over to the controls, right away, the first thing I noticed is that they felt clunky. I felt that dodging was a chore as you didn’t always move in the direction you wanted to move to and that your actions were slow regardless if you were using a quicker weapon like the dagger or claws. I guess the most accurate way to describe it would to be that it was lagging. It just didn’t feel right but I was able to get over that part. But compared to say, Dark Souls, it definitely wasn’t as responsive or as responsive as you can get in a Souls game. I definitely had issues trying to run around enemies at times and even when I was able to get directly behind them for a back stab I encountered issues that either ignored the fact that I was behind the baddie or I simply wasn’t able to attack them fast enough. Another issue I had with the game was the camera angles. In the middle of combat the camera can and will move all over the play. In most of my play through, when I was attacking or defending and I tried to back step or run, the camera would move the opposite way – causing me to frantically re-position the camera so I could see what I was doing again and not get killed while my back was exposed. Load time was also a concern as I experienced a 12-15 second wait every time I died and dying is something that one is going to do over and over in this game, a shorter load time is a must. I can’t see it being much of an issue on a PC; however, on consoles this definitely needs to be lowered otherwise it’s going to cause some very frustrated game sessions. That’s not to say that Lords of the Fallen is a bad game but for what CI Games and Deck 13 are trying to do, the things that Lords of the Fallen is doing wrong needs to be corrected in order to shine. Fixing the issue with the controls and camera are definitely the priorities here and I’ll be honest and say that I could live with a locked 30 FPS vs a variable 60 FPS. Consistency is always better when it comes to frame rate and while it’s not idea especially for a current generation console, if it has to be then that’s what needs to happen. While I am still critical of the game if said issues can be addressed then this game definitely will be played on my PC or PS4 in heavy rotation. Finally, we initially were told that we could record any footage of Lord of the Fallen in action but thankfully we were given special permission to do so, so here’s some footage of two of our crew members (Holland and Matthew) as Lords of the Fallen attempts to break their souls. Lords of the Fallen launches on October 28th for the PlayStation 4, Xbox One and PC.